"Pag mali ka, mali ka talaga." What's a girl to do when she's stuck in a moving train while a man sexually harasses her? 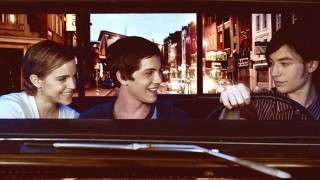 Wait for the next stop and punch him in the face, is what! At least that's what Ryiene Espino did. Ryiene is a college student at Adamson University. She was on her way to school when she was sexually harassed by a man in the same train she was riding. 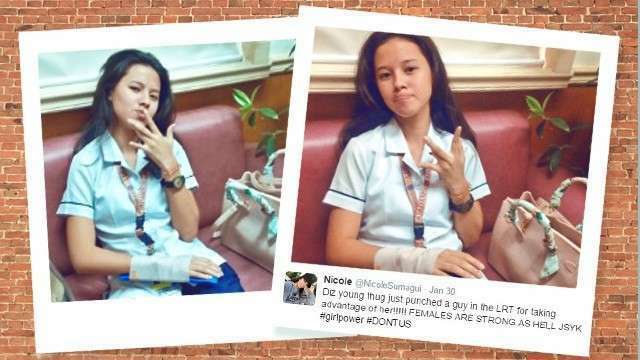 Her story went viral because her best friend Nicole Sumagui posted a picture of her with a broken arm in a cast and a brief explanation of what happened. We got in touch with Nicole and Ryiene and asked them about what transpired that day. Below is their story. "My first class just ended, so I went to our dean's office (Ryiene and I always stay at the office to help out) and saw Ryiene sitting and talking to one of our Psychology professors. I was shocked when I saw her with a cast, so I asked her what happened and eventually shared it on Twitter," shares Nicole. "So nasa LRT ako, tapos nangyari ['yung incident] between Central station papuntang United Nations station. Kasi before talaga ako [na-harass] meron pang nauna sa akin na babae din. Dikit nang dikit 'yung guy sa kanya. Pero bumaba na siya ng Central station, so natira ako. Nung una, kinausap ko pa sya ng maayos. Sabi ko, 'Kuya napapansin ko kanina ka pa dumidikit.' Pero ang nakarinig lang nun is 'yung katabi naming isa at ako. So nung papunta na 'yung train from Central to UN station, kinaskas niya 'yung private part niya sa likod ko. Doon ako napikon, so nung nasa UN station na, inantay ko na mauna 'yung mga bababa, nagpahuli talaga ako. Para in case na habulin niya ako, sarado na 'yung pinto or pasara na. Nung malapit nang makalabas lahat, doon ko na siya sinapak sa cheekbone. So siyempre lahat nagulat. Napayuko na lang 'yung guy." After the incident, Ryiene shared that she texted her mom about it and went straight to the school's clinic because her hand was really painful. When we asked what made her decide to punch the guy in the face (because others would just resort to keeping quiet or staying away instead), she said: "To tell you frankly, this isn't the first time I got sexually harassed. There was this one time I was with Nicole, we were on our way to a nearby mall when someone tried to touch the upper part of my body. I was wearing my backpack and he tried to put his hands under the strap of my bag. It was crazy! When he was about to go down, I shouted inside the jeep and cursed at him. Palaban ako. I was never scared. I'd always fight back. Pag mali ka, mali ka talaga. A lot of people didn't expect this from me rin. Kasi nga payat ako, pero huwag talaga nila akong subukan. Kasi lalaban at lalaban talaga ako." As for her message for fellow girls, here's what she says, "Para doon sa mga babae na binabastos at patuloy pa ring binabastos hanggang ngayon, don't be afraid to fight back. Kasi usually akala ng mga lalaking 'yan na kayang kaya nila tayo, prove them wrong."